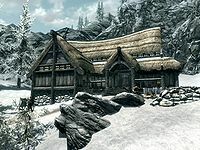 The Hall of the Vigilant is a secluded lodge south-southwest of Dawnstar, home to the Vigilants of Stendarr. The Vigilants are led by Keeper Carcette, who offers expert training in Restoration. 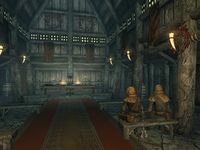 When first entering she can be found leaning over the shrine of Stendarr on the long table at the west end of the hall, or in her bed in an adjoining room. † They are all killed once you reach level 10 or start the quest DawnguardDG. 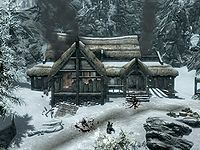 The path leading to the hall is off of the road between Dawnstar and Whiterun and starts a short distance south of Red Road Pass. At the front of the hall is a tanning rack, a wood chopping block and small stable that is big enough for a single horse, while the rear of the building backs up to a rock face. There is a short flight of steps leading up to a covered porch with a few barrels and crates stacked at either side of the only entrance. Entering the hall leads directly into a large common room with a long fire pit across the width of the room at the eastern end. There are two venison chops on the edge of the pit and hanging above the far end is a rack holding five rabbits. Behind the fire pit are a few barrels, one of which has a haunch of raw venison on top, while from the ceiling hang two garlic braids, a bunch of dried elves ear and a bunch of dried frost mirriam. In the northeastern corner is an alchemy lab with a potion of stamina and a potion of the defender on top. 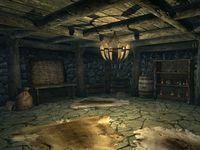 At the western end of the room is a long wooden table with a shrine to Stendarr on top, along with a wolf pelt, a bowl of vampire dust, a bowl of bone meal, a daedra heart, a random, possibly enchanted steel mace, a couple of candlesticks, and some plates. All of these items are marked as owned, and taking them is considered stealing. There are three pairs of wooden benches facing the shrine. Opposite the entrance is a practice dummy with some bales of straw behind it and a long wooden table to the left. On the table are two bottles of alto wine, a bottle of wine, and several loaves of bread in a bowl. In the southeastern corner is a couple of barrels, with a tall wardrobe containing fine clothes to the right and a narrow table against the south wall, to the left. In the northwestern corner is the top of a flight of stairs leading to the basement. Against the north wall is a set of shelves holding two bottles of alto wine, six bottles of wine, and four loaves of bread. To the right of this is a door to a larger bedroom used by Keeper Carcette. It contains an unowned single bed coming out from the north wall with an expert-locked chest at the foot and small bedside tables on either side. To the right is a narrow wooden table with three bottles of alto wine, a small coin purse and an empty strongbox on top and a food sack and a pair of boots underneath. Against the east wall is a dresser with a set of clothes and some cheap crockery on top. In the southeastern corner is a long wooden table with another alchemy lab built in and an iron dagger, a medium coin purse, three bottles of wine, a bowl of red and green apples, four loose gold coins and some bread on top. Along the south wall are two small bedrooms. The first contains an owned single bed in the southeast corner with an unlocked wooden chest and wardrobe at the foot of it and a round wooden table and chair to the right, with a bottle of Black-Briar mead and a bowl of tomato soup on the table top. The second bedroom contains an owned single bed in the southwestern corner with an unlocked chest and dresser at the foot and a wooden table and chair to the left, with a bottle of alto wine on the table top. On the dresser is a basket containing three cabbages and a bowl containing a loaf of bread and a leek. The staircase leads down to a wooden door with another flight of stairs opening into a large room containing six empty weapon racks on the west wall with an unlocked chest to the left. Against the south wall is a set of shelves holding two ice wraith teeth, a salt pile, a Nordic barnacle and four slaughterfish eggs, a taproot, two bunches of tundra cotton, three potions of cure disease, one of cure poison, a random potion of healing and a potion of the Knight. To the left is a barrel containing ingredients with a giant's toe, a bunch of lavender, and a bowl of glow dust on top. In the southeastern corner is another practice dummy with bales behind it, and leaning against the east wall on top of a small unit is a tactical map of Skyrim. In the northeastern corner is a low table and chair with a copy of the Heavy Armor skill book The Knights of the Nine, a medium coin purse and five loose gold coins. All of these items, except the book, are also owned by the Vigilants. With the Dawnguard add-on installed, the Hall of the Vigilant is destroyed by vampires once you reach level 10 or start the quest Dawnguard. As you approach you will see blood splatters on the ground, then the body of a death hound. 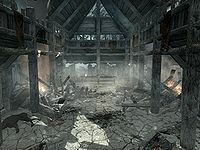 The tanning rack and front porch will both have been destroyed, while inside will be a complete shamble, with the bodies of dead vampires and death hounds among the smoldering rubble, along with a copy of The Aetherium Wars and miscellaneous clutter. There is an unlocked chest in the eastern corner, the long table where the shrine to Stendarr once stood, and a food barrel at the back of the room. Nothing else of interest survived the fire, nor is the basement accessible any longer. The location can be marked as cleared by killing all the Vigilants inside. With Dawnguard installed, this becomes impossible after level 10 due to the hall's destruction. The door will not open, this glitch will stay throughout the entire game. ? Try reloading from a previous save.